I can’t escape the 1970s. I want to live in the present. I can’t escape the present. I want to live in the 1970s. I am trapped somewhere in between, like a guy on a baseball card whose uniform and cap are clumsily morphing from the colors and logo of one team to the colors and logo of another. These baseball cards ended a long time ago, but here I am again, starting another year at the beginning of the end. The end for Jim Todd came on September 28, 1979. Earlier in the year he had gotten cut loose from the terrible Mariners but found a home back on the Oakland A’s, the team with which he’d earlier had a brief moment of muted middle reliever glory. The A’s had been good team during Todd’s previous stint, but they were not good anymore. In fact, they were arguably the worst team of the entire decade and in terms of losses inarguably the worst major league team that has ever been fielded in Oakland. They lost 108 games and probably should have lost even more. They scored fewer runs than anyone in the league and gave up more runs than all but one team in the league. 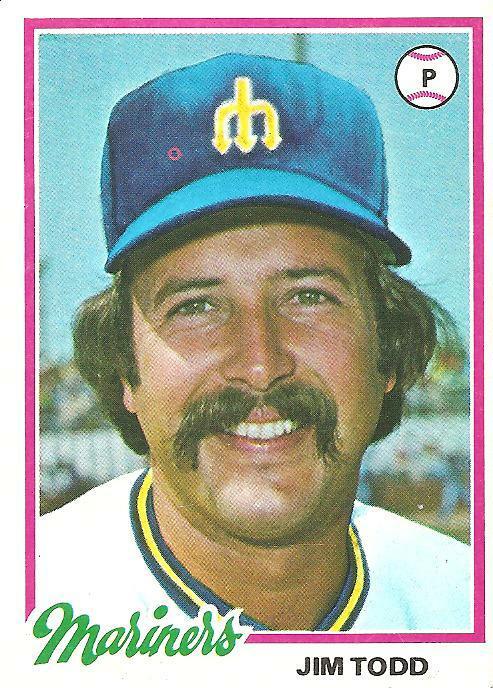 The least effective pitcher on this miserable excursion was Jim Todd, with a team-low ERA of 6.56. But because the team was so bad he kept getting called into games right up until the end, which brings us back to September 28. The A’s starter, Steve McCatty, was torched for eight runs in three innings. Todd was called in with his team behind 8-0. He finished out the game, surrendering eight hits and three runs in five innings of major league baseball that would be called in most places meaningless. But I wish I could have been there. I love games like that. I love them. I’m not trying to be ironic. I love the feeling that nothing whatsoever seems to be happening. It was the A’s 107th loss, and that was it for Jim Todd. Exactly one week earlier, a song titled “Escape” was released. The song would eventually become ubiquitous, a number 1 hit in both 1979 and 1980, but this would not occur for a couple of months after its release, possibly because the song did not initially include the parenthetical subtitle—“(the Piña Colada Song)”—that was soon added to help legions of heretofore confused morons find and purchase the record. With this subtitle in place, the song became what all pop music aspires to be, a hideous epidemic. Soon enough it disappeared and became dated almost instantly but then eventually came back to life as an oldie. I heard it the other day on a station that uses the word “remember” in its promotional jingles. You hear that word a lot on oldies stations, but the songs on oldies stations have been played so often that there is no way anyone could ever connect them anymore to authentic moments from the past. There is some kind of insidious anaesthetization of the masses through the numbing effects of corporatized non-specific nostalgia. Are you remembering anything when you hear an old hit song, or are you covering yourself up and hiding in a warm blanket of the familiar? I want that blanket; I hate that blanket. I wish I could watch television forever and do nothing else besides sleep and eat and sleep and sleep and nothing and nothing and much more nothing. I lack peace. I am always worried. The world as it is now seems unfathomable and fragmented, the shards animated and buzzing toward me from the corners of my vision, from the margin of every moment, every moment a visit to a web page riddled with pleas, attempts to grab my attention and fuel the sense that something is missing, something that will always pull at me from the margins and slip away to new margins in the next moment, the next chattering page. Everything is an ad for something else. Everything is an invitation to escape. There is no escape. Josh, I check here daily for your posts – realizing that your new commitments make your posts less frequent. None the less, when they appear they never disappoint. This is the perfect example, simple yet sublime, heartwrenching yet hilarious. Though only a couple years younger than you, I find myself trapped in the 80’s. I especially love your last two sentences. Brought to mind the classic Eagles line – You can checkout any time you like, But you can never leave! I’m with you on this, Josh. It’s a brave (and that’s not really the word I want to use) new world, and we just have to find our way in it. The world of 1979 and Rupert Holmes (I remember the song, too) didn’t allow for thoughts to be put down and then instantly shared with the wider world, so perhaps that’s something positive. I admit it’s a reach, though. My memory of Jim Todd comes from June, 1976, when Charlie Finley tried to sell Vida Blue, Rollie Fingers and Joe Rudi to the Red Sox and Yankees for cash. Bowie Kuhn blocked the trades. Finley refused to play Blue, Fingers, and Rudi. Todd was the A’s union representative at the time. The A’s, under Todd’s direction, voted to go on strike on June 27 if Finley didn’t let the players play. My memory of this is fuzzy. It may be mistaken, confused with some other events. But I remember going to the Coliseum that Sunday afternoon to the game. I remember not being sure if the game was going to be played. I remember thinking it was weird that Todd, of all players, was the one who was leading a rebellion against Finley. And I remember feeling happy and relieved to see the players, Todd among them, walk out onto the field to warm up. Finley had relented. Unsurprisingly, Todd was traded away the next offseason. A couple years ago we got a “new” radio station here (Rochester, NY). Really just a re-format from whatever was so unpopular as to lose the ratings race. Anyway, new corporate station with a new catch phrase: “We play everything.” Supposedly like “your iPod on shuffle.” Within the first three days, just listening in the car on the way to and from work (20 min. each way), we heard the Pina Colada song three times. I guess their iPod got stuck. I kind of gave up on them after that. I am a big fan of your writing, Josh. Your evocative prose brings back memories of the 70s. I remember “Escape” but my most vivid memory of that fall is waking up and eating a bowl of Cocoa Puffs while viewing grainy images of the Ayatollah, burning effigies of President Carter and blindfolded American hostages before walking to the third grade. Your book on the Bad News Bears in Breaking Training is brilliant. Jim Todd and Pina Colada song made my day/week. After stumbling through the week of frustration I ended up at the ER for a battery of tests. What I need is a vacation. But I miss the 60’s, 70’s and 80’s when life was better and the next trip/vacation/Mets/Yankees/Orioles game was just ahead. Jerry Savage, C’ville, Va.
We’re all sort of scrambling to put our finger on “it” whatever it is. You are a fine writer, amazing really. This is one of your all-timers. You summed up the feelings of most guys in our age group. WOW!